I was on Swedish radio yesterday, in the weekly science/sustainability show "Klotet"(The Globe). The theme of this episode was The cloud devours electricity - can we store data sustainably? ("Molnet slukar el - går det att lagra data hållbart?"). The show was built up around two pre-recoded reportages and they also had two invited guests who commented and discussed the intersection of on the one hand computing and social media use and on the other hand sustainability. Besides me, the other guest was professor of Communication Systems Erik Agrell from Chalmers University of Technology in Gothenburg. I had to go to Uppsala to record the show so it took half a day (plus preparations!). The chat/interview with me and Erik took an hour but was later cut down to 20 minutes or so. - Is this a big problem now and/or in the future? If so, how do we solve it? - Do people need to change their behaviour (just as we need to change how we transport ourselves etc.)? - How far can (future) technical developments take us? It just so happens that I am giving a ph.d. course this term (together with my colleague Miriam Börjesson Rivera) and several of these questions relate to issues we discussed at the previous seminar or that we will discuss at the next seminar. So I prepared by leafing through paper I had just read and by reading papers we will discuss at our upcoming seminar so that was pretty convenient. Preist, C., Schien, D., & Blevis, E. (2016). Understanding and mitigating the effects of device and cloud service design decisions on the environmental footprint of digital infrastructure. In Proceedings of the 2016 CHI Conference on Human Factors in Computing Systems (pp. 1324-1337). ACM. 1) "Effectively, the provision of digital services to high-end users stimulates latent demand in mainstream users for such services". 2) "The mainstream users then pick up devices and services which were formerly high-end, and they become embedded in everyday practice. Services that most users were happy without become essential to everyday life for the majority of the populace in developed countries." 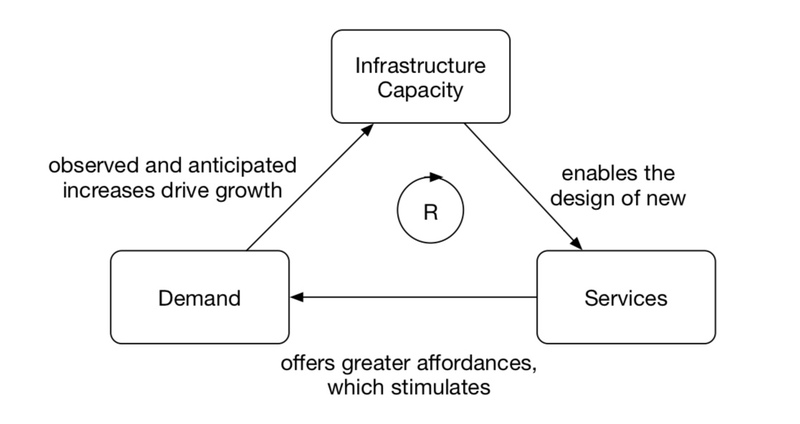 3) "This results in a reinforcing feedback loop encouraging growth of the digital infrastructure." The paper also has a long list of design principles that drives the increase in infrastructure demand that I found useful when I exemplified and pretended that I used a GoPro camera to record the daily commute to my job. Such a video stream could be automatically backed up to the cloud and I might also make "unreasonable" demands at a later point in time, for example assuming that I will have instant access to this video stream and can choose to share it a year later when I'm on vacation in Antarctica (filmed in high-definition video of course). Basically I wanted to emphasise that the infrastructure does not grow autonomously but rather because new technical possibilities (increased storage, increased bandwidth, new capabilities and features in the electronic gadgets we buy and in the software that runs them) creates the possibilities for developing new high-end data-intensive services and because we as users are quick to pick up those services and incorporate them into our behaviours and into our lives. This line of reasoning problematises and opens up discussions about our behaviour. Are there limits to our needs (or our "needs", e.g. wants)? We only have 24 hours per day, but we can replace less data-intensive practices with more data-intensive practices, including but not limited to using more than one device/service simultaneously. We should all switch to buying ecological food, but it costs more so many people don't. It could however be the case that many buy ecological food not in order to "save the environment" but because they believe it is more healthy for themselves and because they care about their children's health. So these two motivations pull in the same direction and it might be that the latter (health) has more pull than the former (sustainability). It might similarly be an uphill battle to try to convince people to use their phones less in order to "save the environment", but there might exist strong non-sustainbility reasons for why we should think about tempering our use of electronic gadgets and these drivers could also have beneficial effects in terms of sustainability - so we should explore which they are. We have four examples (reasons) in the paper but I'll just mention one here and that is "Relationships". It might be beneficial for our close relationships if we put our phones/gadgets away more often; We might ban them from the second floor in the house (where our bedrooms are) or from the dinner table (to encourage unmediated face to face conversations). Some schools have "smartphone hotels" where you park your phone, perhaps we should have smartphone hotels also in our homes? Perhaps "parental controls" should be extended to cover the whole family's use of electronic gadgets in the home? I also cursorily raised the questions of etiquette in the radio show. There are etiquette rules in many different areas of life but few around our use of electronic gadgets. Perhaps we should speed up the invention of such rules? For a fascinating take on the evolution of etiquette, do see my blog post about Norbert Elias' (1939) book "The Civilizing Process", a book that in detail analyses the evolution of etiquette rules over centuries (do also look the quotes further down in that blog post). All in all it was fun to be on radio. I also thought a bit about what I could have done different so that my next appearance on radio will be better. Lastly I also suggested two other topics for radio shows so don't be surprised if I write a new blog post about my next appearance on radio a year or so from now. I just submitted a research grant application, "Decreased CO2-emissions in flight-intensive organisations: from data to practice", to the Swedish Energy Agency in response to their call "Contribute to the creation of a transport efficient society". The application is written together with my colleagues Elina Eriksson, Björn Hedin and Jarmo Laaksolahti but it is also written with our new collaborator Markus Robért who works at the Department of Sustainable Development, Environmental Sciences and Engineering at the KTH School of Architecture and the Built Environment. We got a tip-off some time ago to get in touch with Markus through Göran Finnveden who is vice-president for sustainable development at KTH, and, our collaboration with Markus has great promise. This application builds on work Markus has pursued for more than a decade, but it takes his work in a direction that he himself might not have thought of. Also, Markus is just one person but now he gets help from four others to take "his" research to the next level. To us, it's instead a great opportunity to explore an area we are interested in by cooperating with and building on work that someone else has already done for more than a decade. In flight-intensive organizations, many employees travel both frequently and far - resulting in large CO2 emissions. At management level, there is often an awareness and a willingness to change, as expressed for example through internal climate goals. But at those levels in the organization where concrete decisions are made about when, where and how to travel, there is a lack of awareness and tools to manage these challenges. In this project, we will create and test practical tools to reduce travel-related CO2 emissions, thereby moving from words to action. By using a structured method in combination with analog and digital tools, the project will take stock, visualize, design, plan and mediate negotiations about departmental and individual CO2 emissions and the results will be followed up regularly. The project aims to give flight-intensive organizations greater opportunities to reach or exceed climate targets, thereby contributing to an energy-efficient and sustainable future. We will in this project use a CO2 currency and a workshop methodology to reach departments and individual researchers and encourage them to reflect on how they should proceed in order to reduce their travel emissions - without compromising the quality of their research. Our process will make it possible for individuals to place their own travel in a larger context and it also focuses on equality and justice by implicitly or explicitly asking questions of the type "Who flies? ", "How much? ", "Who will reduce his/her flying?" and "How can this happen?". There are several things that are neat about this application. One of them is that Markus runs an annual symposium for the 80-ish organisations that currently uses CERO. It's a lot of work for him to organise the symposium alone, but we can help him out and this project would of course be part of the program during the three years that it would run. Another neat thing is that besides presenting the results of the project in (open access) journal articles, we have pledged to only present the results at conferences that we can attend without flying there. That's a first for me and it basically means that we will only present it in Europe (and preferably mid- to northern Europe at that). If there ever was an application where it felt like we hit all the marks, well, then this is it. We were definitely on a high as we handed in the application. The Energy Agency will hand out funds for at least 10 projects and we have so much faith in our application that we were confident there just can't be 10 other applications that are better than our. We hope. What workshop participants did not know until they showed up is that the workshop had a back story. "Futures", The journal of policy, planning and futures studies celebrates its 50th anniversary this year with no less than three special issues. The theme of one of these special issues is "Wise Futures" and the editors invite submissions in the form of "dialogues on the futures of wisdom, i.e. what might be considered responsible and wise in 2068, and why". The editors of the special issue more specifically ask for contributions in the form of "structured reports on conversations", so we planned and organised a "conversation" on wisdom in the form of a conference workshop! We hope to be able to submit something to the special issue (the deadline is December 31) but us organisers first have to discuss how, since there is uncertainty about the genre "structured reports on conversations". None of us have worked with, or indeed even seen such reports before. To participate in the workshop, prospective participants had to submit a fictional abstract, i.e. an abstract of a scientific paper that will be written 50 years from now. Fictional abstracts is a new genre too, but we published some helpful guidelines for how to create compelling fictional abstracts on the workshop webpage to help prospective participants with their contributions. Since the submitted abstracts oftentimes were the participants' first attempt at a fictional abstract, we reviewed and gave feedback to almost all submissions and encouraged participants to rewrite their abstracts. The two exceptions were the abstracts by Sus Lyckvi (Chalmers, Swe) and Britta Schulte (UCL, UK) which were great already when they were submitted. I publish both these abstracts below (with permission from the authors) as well as my own fictional abstract. In the end there were nine contributions (three more had, for various reasons, unfortunately been withdrawn before the workshop) and ten persons showed up to the workshop (including workshop organisers Daniel, Elina and Ben). The workshop itself was a success - time flew as 90 minute sessions felt like they came to an end in the blink of an eye. I have to say that it was the best workshop I have ever organised and possibly the best I have attended too. We took copious notes and also recorded parts of the workshop, but have not yet started to look at the material collected. The topic was tough; the year 2068 is far into the future, "wisdom" is elusive and the connection to computers/human-computer interaction is not necessarily obvious. It still felt like we managed to make headway and had we had some great discussions on the way. As to the nine contributions, most fit the "Beware!" category where they warned about unwise futures. That might be in the nature of writing up an abstract for a scientific paper; you first have to identify a problem and then go on and try to solve it. Only a handful of papers were in the "Rejoice!" category. Mine was one, but I was sorry to learn that my abstract was a bit too convoluted - I had been overly "clever" when I wrote it and some of the finer (but central!) nuances were apparently hard to understand. It might be that that is the case for each fictional abstract. I have the distinct feeling that abstract authors could talk endlessly about about their abstract and the work that went into creating it, while the reader would need to read the abstract more than once to understand even half of it. You do have the chance to do that though; below are three of the nine abstracts, Sus Lyckvi's "Be All In or Get All Out: Exploring Options for CAI-Workers and CAI-Technology", Britta Schulte's "DEO ex Machina: a new Framework for Virtual Agents in Automated Elderly Care Provision" and my own "Dark Patches Creator Personas". Collaborative AIs (CAIs) provide the combination of human creativity, empathy and intuition with extensive computational power and information access. Since the late 2020ies CAI-technology has advanced many research fields [2036-1, 2036-2, 2038, 2042], but it has also been misused, most notably during the First Panic . But – whereas there is a vivid discussion on the consequences of CAI-technology, little is said about the situation of CAI-workers, despite the fact that as many as 23.2 % of them are diagnosed with a personality disorders such as schizophrenia, bipolarity or depression . In this study we made deep-interviews with 152 CAI-workers, using the insights from this in 16 tech-trials with 48 of the interviewees. Our findings show that CAI-workers are effectively excluded from society not only physically – living in closed compounds due to corporate data protection policies – but also due to the public’s attitude towards them: anger over lost jobs, envy from rejects, and the very common fear that CAIs are the last step towards fully sentient AIs . Further, there are issues of self-image, being superhuman whilst working  vs significantly less able off-duty. In effect, CAI-workers are at the same time their employer’s most valuable asset, and its slaves, contained and deprived of normal cognitive abilities. Accordingly, the tech trials indicated that prolonged CAI-state was highly favorable. Consequently, we argue that it is time to discuss the future of CAI-technology – should it be abandoned entirely or taken further by allowing perpetual CAI-state, in effect nurturing a new type of humans? 2042 Eira Lundgren & Conor McCloud, Ensuring the Democratic Process in the Scot-Scandi Election Using CAI Technology on Citizen Input. International Journal of Interaction Design, Vol 20, Issue 2, March 2042, Springer. 2050 Eira Lundgren & Ireli Lyckvi, The Panic in 2049 – how thwarted gossip algorithms broke the West US, Random O’Reilly 2050. (1) Due to the rapid development of the fields of CAI-technology, Exo-applications and Brain-Computer Interaction, references are typically made to the publication year of a paper, rather than the author(s). Author Keywords: Design fiction; elderly care; virtual human interaction. Dark patches have become an increasingly large problem on the Internet as of late. Their noxious effects are well known; they create pockets and corridors for illegal high-frequency communication and transactions and widen the market for dark hardware. While not in direct conflict with the 2036 global Computing Backwards Compatibility Act, their existence undermine or come into direct conflict with social equity and they directly clash with the UN Global Development Goal #17, “An affordable Internet for all”. While much technical research has tried to find algorithmic solutions to the problem of dark patches, little is known of drivers behind their creation. We here present the results of a large-scale study of the dark patch DIY hackers and programmers-for-hire in three European countries. Besides the results of the study itself, we also present five fictive dark patch creator personas (”psychological profiles”). Since we nowadays take the equitable sharing of limited resources such as the Internet for granted, we have to be all the more vigilant when various kinds of deviants and perverts try to appropriate more than their fair share of The Commons. In that vein, we end the paper with suggestion for future work that will help crime and counter-terrorism agencies in their work of understanding, identifying and apprehending dark patch creators. This works should be seen as a complement to more technically oriented measures of identifying and neutralizing dark patch code. Author Keywords: Dark patches; Human-Computer Interaction, personas, computer security, counterterrorism. KTH Sustainability Office award money for small (maximum 100 000 SEK, maximum 1 year) interdisciplinary projects, "Environment and sustainability without boundaries"
I handed in an application there a few minutes before the May 2 deadline, "Homo Colossus In Real Life (HC-IRL)", together with co-applicants Mario Romero (Associate professor in Human-Computer Interaction with focus on Interactive Computer Graphics & Visualization), Jonas Åkerman (environmental researcher and one of Sweden's premier researchers on GHG emissions in general and emissions from air travel in particular) and Per Hasselberg (Konstfrämjandet/People's Movements for Art Promotion). I have written about Homo Colossus several times on the blog before (November 2016, again in November 2016 and in December 2017) so instead of explaining what that concept means, I just paste the short project description below (where I explain what the concept means). The project is basically a fact-finding mission where I will do the brunt of the work and then have monthly meetings with a "steering committee" (the co-applicants that are listed above). The fact-finding mission would run from Q3 2018 (September) to the end of Q1 2019 (March). The last quarter of the next academic year (Q4 2019) would be reserved for compiling and drawing resources together to produce a report/prospectus (decision support), including a realistic budget, sketches/suggestions for placement and design of Homo Colossus on the KTH Campus etc. This report would be handed over to KTH and the best-case scenario is that KTH would then decide to go ahead and build Homo Colossus - in all its might - somewhere on campus. As part of the report, we also plan to either produce a 20-second 3-D previsualization OR produce sketches that will help external actors (e.g. KTH decision makers) visualise what a finished Homo Colossus could look like. I will get to know if this application has been granted or not sometime in June. HC-IRL is a prestudy for a larger science and art project, ”Homo Colossus” (Catton 1986, Catton 1987). A human being who weighs 70 kilos needs to eat food with an energy content of less than 2000 kcal per day (a bit more than 2 kWh/day), but is easy for a Swede to use 50 to 100 times more energy in his or her everyday life. So how large would the average Swede be if he or she was colossal and had to eat as much food/energy as we use in our everyday lives? The answer is that the average Swede would be around 12 meters tall and weigh around 25 000 kilos. The purpose of the project ”Homo Colossus” is to build a replica of a colossal human being and (for a limited period of time) place it on the KTH campus. The purpose of this prestudy, ”HC-IRL” is to produce information that supports a KTH decision about whether to go ahead with actually building such a replica or not. We here assume that KTH, should it go ahead and decide to build Homo Colossus on the KTH campus, will pay for the costs, but we will also as part of this application keep an eye on the possibilities of finding supplemental external funding (from a foundation, etc.). The prestudy will partly examine practical aspects of building Homo Colossus (shape, pose (standing, sitting, etc. ), appearance, materials, weight, cost/budget, etc.) and partly investigating administrative and practical obstacles/possibilities for building a Homo Colossus on the KTH Campus (location, permissions, security issues etc.). We will also contact artists to open up discussions about feasibility and implementation of the project. We have to that effect ”recruited” Per Hasselberg from the People's Movements for Art Promotion (Konstfrämjandet) for this application and he will partake in the project/prestudy as well as act as a door opener to researchers, teachers and artists who work with public art at the The Royal Institute of Art (Kungliga Konsthögskolan/Mejan – for example Åsa Andersson Broms, artist and Senior Lecturer in Fine Art) and elsewhere. KTH is also at the cusp of starting up a center for Art, Technology and Design (KTD) that we would furthermore like to cooperate with. There is a distinct possibility that the first director of the center will be main applicant Pargman’s current colleague, Professor of Media Technology/Sound and Music Computing researcher Roberto Bresin who is informed about this application. Another potential informant/partner is Programme Director Federico Favero at KTH Architecture/Architectural Lighting and Design. While contacts have been initiated also with other KTH researchers, we here only apply for money for the main applicant and the co-applicants previously listed. - Catton, W. R. (1986). Homo colossus and the technological turn‐around. Sociological Spectrum, 6(2), 121-147. - Catton, W. R. (1987). The world's most polymorphic species: Carrying capacity transgressed in two ways. BioScience, 37(6), 413-419. My previous blog post was about a workshop proposal for the upcoming NordiCHI conference, but I'm also part of another workshop proposal for that conference, "Circular thinking in sustainable HCI: Revisiting the link between invention and disposal". This proposal was spearheaded by Maja van der Velden from the University of Oslo and the workshop is organised together with Alma Leora Culén, Elina Eriksson, Daniel Pargman, Oliver Bates and Miquel Ballester. Both Maja and Oliver participated in our sustainability-themed NordiCHI 2016 workshop and we have discussed the possibility of putting together a workshop for NordiCHI 2018 workshop of quite some time, but it was only at the very end that things actually happened. When Maja took charge, the workshop also changed focused to closer align with her specific research interests. The aim of the workshop is thus to explore circularity as a principle of sustainable HCI. Every new invention should integrate its own disposal - where disposal can mean recycling, reuse, repair, redistribution, remanufacture or refurbishment, forming the basis for a range of design approaches such as design for repair/repairability, design for recyclability and design for circularity. The (full-day) workshop is divided into four phases: a show and tell session where participants present and discuss "an object or material that represent their work in sustainable HCI", a mapping session, an exploratory design session and finally a session where we critically reflect on circularity. “Circularity is the next big thing in design”, they say, but in what way can circularity contribute to sustainable HCI? In this workshop we will critically engage with the different aspects, applications, and implications of circularity or critical thinking and ask: Is circularity a principle of sustainable HCI? In order to answer this question, the workshop combines a variety of methods, based on a Research through Design approach. The starting points for this exploration are the artefacts that the workshop participants present in a ‘show and tell’ session. The artefacts represent both the participants’ work or interest in sustainable HCI, as well as things to talk about or think with when talking about circularity. Through two more exploratory sessions, we will give form and shape to what circular thinking can contribute to sustainable HCI. In the final session of the workshop we will map our findings on the most iconic digital device of our time, the mobile phone. Taking a life cycle perspective, we will look into redesigning our own mobile phones into a circular device. Because of the central role of design in the social and environmental sustainability of products and services, we will end our workshop with a final question: who and what will benefit from this re-design? This workshop is also designed to complement the Future Scenarios track at NordiCHI (and shares an organiser). That unique track already brings speculation and design fiction to the NordiCHI conference, and this workshop will complement the track by providing a full day for exploring design fiction in shorter formats (abstracts rather than scenarios) and applying this process collaboratively on the focused topic of wisdom. The background to the workshop theme and the thing that set Elina and me in motion is a call for an upcoming special issue on "Wise Futures" in the journal "Futures". If the conversations at the workshop are riveting enough, we will most probably aim for writing a "structured report on conversations" for that special issue. The turn-around time is impressively short, the workshop submission deadline was May 2 and we will know already on May 14 if we will get the opportunity to organise this workshop. If we do get that opportunity, we then need to have a workshop webpage up and running already on May 28. Below is the workshop abstract - which should not be confused with the (coming) call for participation. The abstract is rather a summary of the longer workshop description (proposal) and it will primarily be used in the process of selecting a good mix of workshops that will be held at the conference. The NordiCHI workshops will be held on September 29 and 30 and the main conference will then be held between October 1-3. To apply to the workshop, attendees will submit a fictional abstract - an abstract from a research paper yet to be written. We will then share these fictive abstracts, and, through peer reflection, unpick critical tensions in the advancement of computing over the next decades. By focusing on an end goal (“wisdom”) instead of on particular technologies in the present (machine learning, IoT etc. ), we open up for discussions of what future(s) we want computing to support, what needs to happen for us to “end up” in certain futures rather than others, and what needs to be done in the present and in the near future to maximize the potential for our work to contribute to the creation of desirable rather than undesirable futures. I read the four books below a bit more than a year ago, between mid-February and mid-April 2017. All four books relate to technology and its use in a social context but they also differ in various ways, for example in how much they relate specifically to computing. The asterisks (*) represent the number of quotes that can be found further down in this blog post. Here's the previous blog post about books I have read. 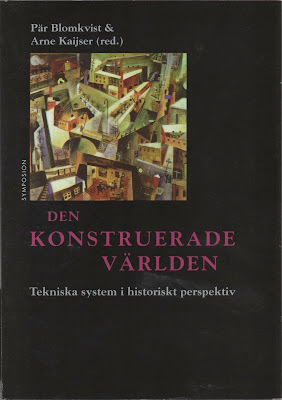 **** I got my copy of Pär Blomkvist and Arne Kaijser's (1998) edited book "Den konstruerade världen: Tekniska system i ett historiskt perspektiv [The constructed world: Technical systems in historical perspectives] directly in my hand from Pär Blomkvist 10 or so years ago. It has thus taken quite some time for me to come around to reading it, but the fact that it was written 20 years ago wasn't a big problems since it for the most part contains historical analyses of various aspects of the emergence and growth of Large Technical Systems (LTS) like rail, electricity, telephones, sewage systems etc. The one exception was the last chapter that treated the development of the Internet 1957-1997. "Is the Internet a technology that unites us in universal brotherhood or that makes us apathetic? Is the telephone emancipatory? What does municipal democracy have to do with the history of emptying latrines? Can a large technical system be nationalistic? Is technological development even a political issue? We live in the era of large technical systems. Hardly anything else has changed people's living conditions more during the last 150 years than the expansion of technical systems such as railways, water and sewerage, electricity, telephony, the automobile and the Internet. Nevertheless, few historical studies have been made of these systems, but over the past decade, a new multidisciplinary research area has evolved that is focused on studying large technical systems. In this anthology, thirteen writers discuss how such systems emerge and how they affect our lives and our society." 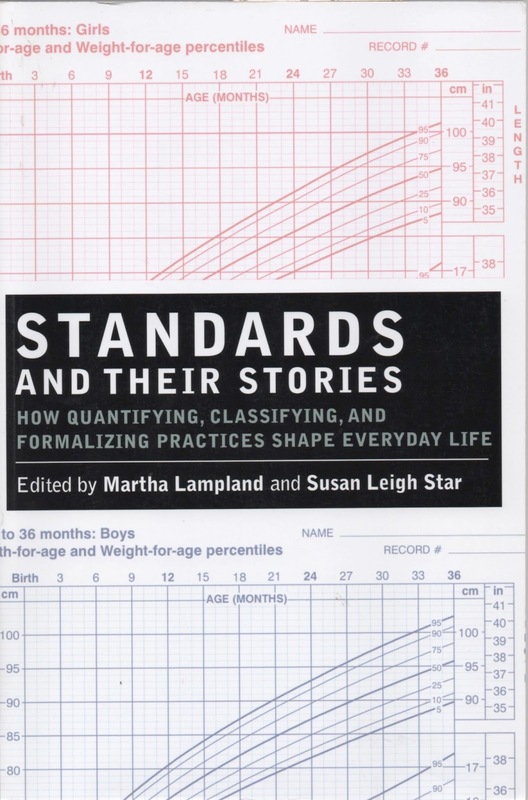 *************************** Martha Lampland and Susan Leigh Star's (2009) "Standards and their stories: How quantifying, classifying, and formalizing practices shape everyday life" is another book that I have owned for 10 years but that I haven't read from back to back until now. This book is special for me as I, together with professor Jacob Palme (who retired 10 years ago), have a chapter (pdf available here) with the hard-hitting title "ASCII imperialism" in the book. There are also more than a dozen quotes from our chapter further below. While the topic of standards and standardisation definitely is a sidetrack compared to my research interests both back then and now, our chapter actually has a long prehistory. Back in 1998, when I was a young ph.d. student, I presented a text called "Reflections on cultural bias and adaptation" at the first international conference on Cultural Attitudes Towards Communication and Technology (CATaC). That paper (available here!) together with some others from the conference were later republished in a 1999 special issue of journal "Javnost - The Public" (Journal of the European Institute for Communication and Culture). This later led me to team up with Jacob Palme and submit another paper, "Linguistic standardization on the Internet" to the 2004 CATaC conference (conference theme: "Off the shelf or from the ground up? ICTs and cultural marginalization, homogenization and hybridization"). Long story short: the 2009 book chapter is an extended and further developed version of our 2004 conference paper. With the excellent facilities that Google Scholar nowadays provide, I looked closer at who has (ever) referred to this paper. I notice that it must have been hard for people to find the text because while it has been quoted altogether 28 times since it was published, less than a third of those quotes were made during the first five years after the book was published (2009-2013). It in fact turns out the "best" year for our chapter was 2016 when it was quoted no less than 8 times. It's the same for another chapter in the book (about "metadata standars"); it has been quoted 80 times and 2016 was again the one most popular year. This implies that narrow, edited books easily can become places where texts are buried - although the circulation of this books in particular seems to have picked up over time. Still, this is interesting to keep in mind when weighing the pros and cons of different types of publications. Beside the seven chapters, the book is a bit special due to the fact that it has between two to four standards-related anecdotes and stories (not seldom newspaper articles) sandwiched in-between each chapter (e.g. "Coffins expand with Occupants" about weight increase in the US from the Charleston Daily Mail and "Chocolate Directive Now Agreed" from the UK Ministry of Agriculture Fisheries and Food - quite possibly pointing at one of the reasons why the UK voted to leave the European Union). The book also has an interesting appendix that was written by the two editors, "How to unravel standards: Teaching infrastructure studies". "Standards rule our lives. Yeah, standards, that dull, frustrating, topic studied by 'The Society of People Interested in Boring Things.' But this book proves that far from being dull, the stories behind standards are interesting, insightful, and revealing of the workings of bureaucracy. Standards are essential for different stuff made by different companies in different countries to work well together. Whether it is bananas or chocolate, application forms for terrorist training, or the sizes of people's rear ends (critical for airline seats), standards are essential part of life today (all these are covered in the book). This engaging book serves several purposes. It explains much of the history, rationale, and politics of standards. It shows why they have huge social impact, far beyond what most of us realize, often far beyond what was intended." 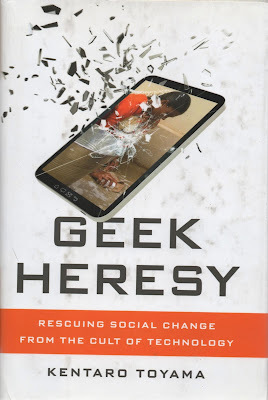 ********************************** I met Kentaro Toyama at the 2015 first workshop on Computing within Limits and later picked up his (then-just-to-be-published) 2015 book "Geek heresy: Rescuing social change from the cult of technology" (book website). Toyama's old-school webpage has a link to his (now-defunct) blog "The ICT4D Jester: Questioning ICT for Development" - a blog where he unpicks ICT for Development - an area he himself has helped found. I can't say that I have read everything on his blog, but looking at when his blog was active (2010-2015 - but mostly during the first three years), I imagine that the blog also functioned as a tool where he could (anonymously) distance himself from, and come to terms with his and others' repeated failures to use technology to alleviate (the effects of) poverty. This is also the main topic of his book, e.g. why doesn't technology deliver on its promises to make the world a better place for everyone - rather than just for the affluent global "haves". I liked this book a lot. It is always great to read a book by someone who has a story to tell and Toyama's background makes the topic of the book intricate because by "rescuing social change from the cult of technology", Toyama also wants to rescues social change from the man he himself once was. He writes in the introduction: "I am a recovering technoholic. I was once addicted to a technological way of solving problems. ... in 2004 ... I jumped at the chance [and] was excited by a new topic: How could electronic technologies contribute to social causes in the world's poorest communities?" "After a decade designing technologies meant to address education, health, and global poverty, award-winning computer scientist Kentaro Toyama came to a difficult conclusion: Even in an age of amazing technology, social progress depends on human changes that gadgets can't deliver. Computers in Bangalore are locked away in dusty cabinets because teachers don't know what to do what them. Mobile phone apps meant to spread hygiene practices in Africa fail to improve health. Executives in Silicon Valley evangelize novel technologies at work even as they send their children to Waldorf schools that ban electronics. And four decades of incredible innovation in America have done nothing to turn the tide of rising poverty and inequality. Why then do we keep hoping that technology will solve our greatest social ills? In this incisive book, Toyama cures us of the manic rhetoric of digital utopians and reinvigorates us with a deeply people-centric view of social change. Contrasting the outlandish claims of tech zealots with stories of [real] people ... Geek Heresy is a heartwarming reminder that it's human wisdom, not machines, that move our world forward." **************************************** Alf Horborg's 2015 book "Nollsummespelet: Teknikfetischism och global miljörättvisa" [The zero sum game: Technology fetischism and global environmental justice] is his second book in Swedish and it's just as good (and just as provocative) as his first. It's hard to keep track of Hornborg's books when he translates them between English and Swedish and back though. This book is a "heavily extended and partly revised version" of the 2013 revised version of his 2011 book "Global ecology and unequal exchange". But his English-language 2016 book "Global magic: Technologies of appropriation from Ancient Rome to Wall Street" is, as far as I understand, also a revised version of this Swedish-language book! And it was just the same with his previous book. "The development of new technologies depends only partly on creativity [because] a new technology must work in conjunction with the prices of energy, raw materials, spare parts, labor and finished products. It would be an illusion to imagine technical arts and engineering as independent from society's way of organising flows of energy and materials ... If a certain kind of category of people can afford to buy a certain technical product, for example if Europeans buy cars whose components are manufactured in China, that is largely due to the fact that Chinese workers earn much less money than the average European." "80 percent [of global solar energy production] is produced in five of the world's richest countries (Germany, Italy, Japan, the United States and Spain) ... solar power, despite high expectations ... continues to be available only in the most affluent sectors in the world system. ... The solar energy produced by Sahara's solar panels will be reserved for those who can afford it - more likely German than Algerians. In other words the same global elite that today can afford to buy oil." 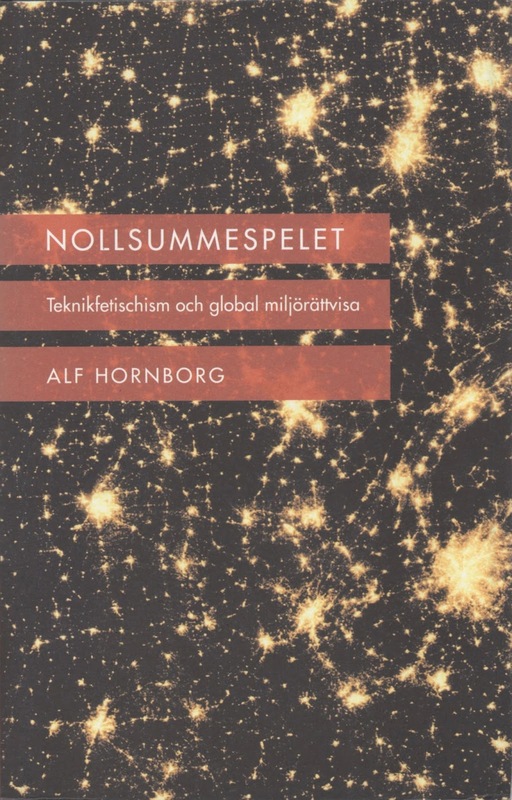 Most of what I have learned about unequal exchange and about "ecological world-systems theory" I have learned from reading texts by Alf Hornborg. Here's a short popular text that can work as an introduction to his thinking, "Why you can’t have free trade and save the planet". ”[Large technical] Systems that were initially linked to visions of the good life as well as with dystopian prophecies about society’s downfall have ... been transformed into unproblematic contrivances without ideological connotations." Blomkvist, P., & Kaijser, A. (2003). Introduction: The invisible systems. In Blomkvist, P., & Kaijser, A. (eds). The constructed world, p.9. "Nobody can avoid noting the wild hopes that are connected to the internet. Telia's slogan "Freedom, Equality, Internet!" speaks of a new and better world where the brotherhood of the French Revolution will be realized interactively across the world. But can we find the enormous political and social potential of this new medium also in the critical voices. The Internet is said to lead to the dissolution of morals, to Internet-addicted couch potatoes and constitute a direct danger to democracy and society as we know it." In Blomkvist, P., & Kaijser, A. (eds). The constructed world, p.17. "The "systems" concept is used extensively in both engineering and the social sciences ... What constitutes the basis of a systems perspective is ... that all technologies can be seen as consisting of tightly or loosely interconnected parts or components which together form an integral whole. For this to work, the different parts need to be coordinated with each other. A system is therefore characterized by strong dependencies between its constituent parts." Summerton, J. (2003). Large technical systems: An introduction to a research field. In Blomkvist, P., & Kaijser, A. (eds). The constructed world, p.21. Fridlund, M. (2003). 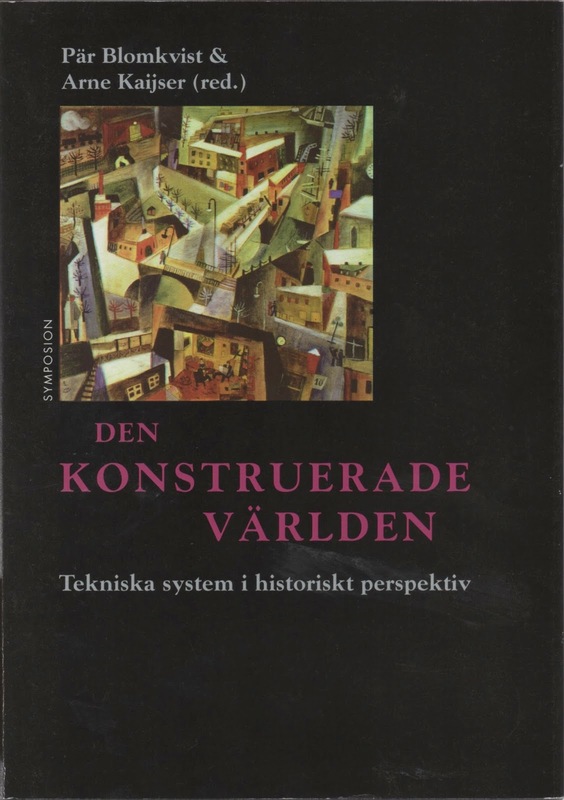 Construction of technology and Swedishness around the turn of the 20th century. In Blomkvist, P., & Kaijser, A. (eds). The constructed world, p.80. Star, S.L. and Lampland, M. (2009). Reckoning with standards. In Lampland, M., & Star, S. L. (eds.). Standards and their stories. In Lampland, M., & Star, S. L. (eds.). Standards and their stories, p.11-13. In Lampland, M., & Star, S. L. (eds.). Standards and their stories, p.14-15. In Lampland, M., & Star, S. L. (eds.). Standards and their stories, p.17. In Lampland, M., & Star, S. L. (eds.). Standards and their stories, p.22. Treas. J. (2009). Age in standards and standards for age. In Lampland, M., & Star, S. L. (eds.). Standards and their stories, p.65. In Lampland, M., & Star, S. L. (eds.). Standards and their stories, p.68. "Outside China, hardly anyone bothered reckoning chronological age. Most people neither knew or cared exactly how long they had lived. [In pre-modern times] There was little reason to separate youths from adults until the advent of formal schools. Age-grading within schools, grouping youngsters by chronological age in the classroom, did not emerge as an educational practice in the United States until the nineteenth century. Later, protective child-labor laws would prove the wedge that finally segregated children from the world of working adults. In Lampland, M., & Star, S. L. (eds.). Standards and their stories, p.69-70. In Lampland, M., & Star, S. L. (eds.). Standards and their stories, p.82. In Lampland, M., & Star, S. L. (eds.). Standards and their stories, p.83-84. On procedures for determining the age of an "ageless" individual. In Lampland, M., & Star, S. L. (eds.). Standards and their stories, p.85. In Lampland, M., & Star, S. L. (eds.). Standards and their stories, p.86. Dunn. E. C. (2009). Standards without Infrastructure. In Lampland, M., & Star, S. L. (eds.). Standards and their stories, p.118-119. Lampland. M. (2009). Classifying laborers: Instinct, property, and the psychology of productivity in Hungary (1920-1956). In Lampland, M., & Star, S. L. (eds.). Standards and their stories, p.126. (1) Hor is etymologically the same world as the English noun and verb *whore*. Pargman, D. & Palme, J. (2009). ASCII imperialism. In Lampland, M., & Star, S. L. (eds.). Standards and their stories, p.177. In Lampland, M., & Star, S. L. (eds.). Standards and their stories, p.177-178. In Lampland, M., & Star, S. L. (eds.). Standards and their stories, p.181. In Lampland, M., & Star, S. L. (eds.). 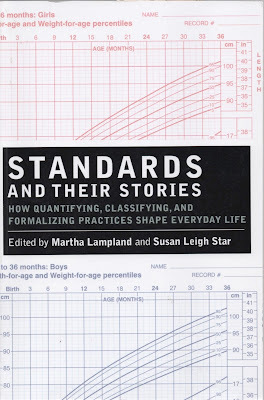 Standards and their stories, p.185-186. In Lampland, M., & Star, S. L. (eds.). Standards and their stories, p.186. In Lampland, M., & Star, S. L. (eds.). Standards and their stories, p.189-190. In Lampland, M., & Star, S. L. (eds.). Standards and their stories, p.192. In Lampland, M., & Star, S. L. (eds.). Standards and their stories, p.198. "’Talent is universal; opportunity is not.’ That’s how Megan Smith, chief technology officer of the United States and former vice president of Google.org, began her opening remarks at the University of California, Berkeley, in the spring of 2011 [but] by equating the Internet with opportunity for underprivileged people, she has made a dubious assumption – an assumption that the Internet can make up for severe non-Internet deficiencies." Toyama, K. (2015). Geek heresy, p.xi-xii. "This book is about … how a misunderstanding about technology’s role in society has infected us – not just the tech industry, but global civilization as a whole – and how it confuses our attempts to address the world’s persistent social problems. The confusion expresses itself as Silicon Valley executives who evangelize cutting-edge technologies at work but send their children to Waldorf schools that ban electronics. Or as a government that spies on its citizens’ emails while promoting the Internet abroad as a bulwark of human rights. Or as a country densely crisscrossed with interactive social media that is nevertheless more politically polarized than ever." Toyama, K. (2015). Geek heresy, p.xiii. "India has pole-vaulted onto the global stage as an IT superpower, but only a thin stratum of the country’s educated elite is part of the phenomenon. The rest – as many as 800 million people who live on less than two dollars a day – are lucky if they can work as servants to the rising middle class." Toyama, K. (2015). Geek heresy, p.3. "Many [rural Indian] schools had neither staff nor finances for ongoing technical support. Computer budgets in education tend to pay for hardware, software, and infrastructure, but they neglect the ongoing costs of storage, upgrades, troubleshooting, maintenance, and repair. And PCs need a lot of care in the hot, dusty, humid conditions of rural indian schools"
Toyama, K. (2015). Geek heresy, p.6. "Each time, we thought we were addressing a real problem. But … in the end it didn’t matter – technology never made up for a lack of good teachers or good principals. Indifferent administrators didn’t suddenly care more because their schools gained clever gadgets; undertrained teachers didn’t improve just because they could use digital content; and schools budgets didn’t expand no matter how many ”cost-saving” machines the schools purchased. If anything, these problems were exacerbated by the technology, which brought its own burdens. These revelations were hard to take. I was … the head of a group that aimed to find digital solutions for the developing world. I wanted nothing more than to see innovation triumph… But exactly where the need was greatest, technology seemed unable to make a difference." Toyama, K. (2015). Geek heresy, p.6-7. "A 2013 study by Robert Fairlie and Jonathan Robinson – economists with no stake in technology – slams a heavy lid on the sarcophagus for the quixotic idea that children will teach themselves digitally. In an experimental trial involving over 1,000 students in grades 6 through 10 in America, they found that students randomly selected to receive laptops for two years certainly spent time on them, but that the time was devoted to games, social networking, and other entertainment. And whatever merit these activities might have in theory, in practice those with laptops did no better ”on a host of educational outcomes, including grades, standardized test scores, credits earned, attendance, and disciplinary actions,” than did a control group without computer access at home. In other words, unfettered access to technology doesn’t cause learning any more than does unfettered access to textbooks." Toyama, K. (2015). Geek heresy, p.12. "Finland and China consistently outperform other countries despite low-tech approaches. In a 2010 report, PISA analysts wrote that ”the bottom line is that the quality of a school system cannot exceed the quality of its teachers,” regardless of available educational resources such as computers. … there’s a big difference between learning the digital tools of modern life (easy to pick up an getting easier by the day, thanks to improving technology) and learning the critical thinking skills necessary for an information age (hard to learn and therefore demanding goo adult guidance)." Toyama, K. (2015). Geek heresy, p.13. "To persevere, children need guidance and encouragement for all the hours of a school day, at least nine months of the year, sustained over twelve years. Electronic technology is simply not up to the task. What’s worse, it distracts students from the necessary effort with blingy rewards and cognitive candy. The essence of quality children’s education continues to be caring, knowledgeable, adult attention." Toyama, K. (2015). Geek heresy, p.15. "As a computer scientist, my education included a lot of math and technology but little of the history or philosophy of my own field. This is a great flaw of most science and engineering curricula. We’re obsessed with what works today, and what might be tomorrow, but we learn little about what came before. So … I met with dozens of professors who had studied different aspects of technology and society. … And here is what I learned. Theorists, despite many fine shades of distinction, fall roughly into four camps: technological utopians, technological skeptics, contextualists, and social determinists. Star Trek is fiction but its technological utopianism is very real MIT Media Lab founder Nicholas Negroponte clearly shares it. So does Google chairman Eric Schmidt. … And then there are technology cheerleaders like Clay Shirky, who shakes pom-poms for Team Digital. … A generation ago, when young people said they wanted to ”change the world” or ”make an impact,” they joined the Peace corps. Now they move to Silicon Valley." Toyama, K. (2015). Geek heresy, p.20-21. "whatever they say and write, what most unites utopians is how they feel about technology. They love it, and they want more. Many believer that every kind of problem can be solved by some invention, often one that is right around the corner. Whether the issue is poverty, bad governance, or climate change, they say things like, ”[There] is no limit to human ingenuity,” and ”When seen through the lens of technology, few resources are truly scarce.” Besotted with gadgets, technological utopians scoff at social institutions like governments, civil society, and traditional firms, which they pity as slow, costly, behind the times, or all of the above. I sympathize with the utopians because I was one myself. … But time after time, I realized that technology alone never did the trick." Toyama, K. (2015). Geek heresy, p.22. "Melvin Kranzberg, a historian of technology, embraced technology’s apparent contradictions. ”Technology,” he wrote in 1986, ”is neither good nor bad; nor is it neutral.” This enigmatic statement captures what is probably the most common view among scholars of technology today: Its outcomes are context-dependent. Technology has both positive and negative impacts because technology and people interact in complex ways." Toyama, K. (2015). Geek heresy, p.24. "good design trumps poor design, but beyond some level of functionality, technical design matters much less than the human elements. The right people can work around a bad technology, but the wrong people will mess up even a good one. This is consistent with a fourth camp of technology-and-society scholarship sometimes called social determinism. … These … theories emphasize that technology is molded and wielded by people. People decide the form of technologies, the purposes of their use, and the outcomes they generate." Toyama, K. (2015). Geek heresy, p.26. "theories of social determinism says that technology is put to use according to underlying human intentions. At the same time, the degree to which technology makes an impact depends on existing human capacities. Put these ideas together and *technology’s primary effect is to amplify human forces*. Like a lever, technology amplifies people’s capacities in the direction of their intentions. A computer allows its user to perform desired knowledge tasks in a way that is faster, easier, or more powerful than the user could without technology. But how much faster, more easily, and more powerfully is in some proportion to the user’s capacity." Toyama, K. (2015). Geek heresy, p.29. "technologies … magnify existing social forces, which themselves can be good, bad, or neutral. … If a private company is failing to make a profit, no one expects that state-of-the-art data centers, better productivity software, and new laptops for all of the employees will turn things around. Yet, that is exactly the logic of so many attempts to fix schools with technology." Toyama, K. (2015). Geek heresy, p.31. "When technologies go mainstream, it’s because they help scratch itches that people already have, not because they create new itches that people don’t want. … Claims of the Internet’s democratizing power fail to take into account the many things that the Internet hasn’t democratized, such as wealth, power, and genius." Toyama, K. (2015). Geek heresy, p.40-41. "New laptops don’t necessarily make employees more productive. State-of-the-art data centers don’t cause better strategic thinking. And knowledge-management systems don’t cause rival departements to share information with one another. Yet CIOs everywhere are asked to perform exactly that sort of wizardry. The more experienced ones are careful not to promise too much. Technology can improve systems that are already working – a kind of amplification – but it doesn’t fix systems that are broken." Toyama, K. (2015). Geek heresy, p.45. "technology is often believed to enhance [relationships]. Nokia’s tagline is ”Connecting People,” and AT&T once used the slogan ”Reach out and touch someone.” There’s no doubt that communication technologies help people connect, but there are at least two ways in which this could happen. Option A says that better tools help us communicate with people we are already inclined to communicate with. Option B says that better tools cause communication to occur where none previously existed or was desired. Amplification votes for option A: We use new tools to communicate more with people we want to connect with anyway. … Option B leads to the misguided belief that more connectivity brings *everyone* closer together. As one utopian put it, ”People will communication more freely and … the effect will be to increase understanding, foster tolerance, and ultimately promote worldwide peace.”"
Toyama, K. (2015). Geek heresy, p.46. "we can predict that in future revolutions, all sides will use or abuse the communication technologies at their disposal. In the nineteenth century, rebels distributed pamphlets, autocrats closed printing presses, and the world heard about it months later by word of mouth. Here in the twenty-first century, rebels organize on Facebook; autocrats shut down the Internet; and the world watches events unfold on YouTube. Perhaps in the twenty-third century, rebels will rally on brain-to-brain transmitters; autocrats will scramble neuro-signals; and the world will watch it all through their synaptically projected awareness modules (known in the future as ”SPAM”)." Toyama, K. (2015). Geek heresy, p.53. "Good credit depends on at least two things: the care with which the loans are made, and the economic capacity of the borrowers. This is true of any loan. Grameen Bank is known to take immense care with its loans. Many of its borrowers are undoubtedly benefiting. But which ones? A closer look at the economists’ data shows that positive effects tend to favor certain subgroups. Microcredit is more beneficial for those with greater wealth and education; for those with existing businesses; and for those with entrepreneurial skills and temperament; and, in some communities, for the men more than for the women, probably because of other sociocultural advantages. In other words, like digital technologies, microcredit also amplifies human forces." Toyama, K. (2015). Geek heresy, p.61. "In any pantheon of packaged interventions, vaccines would reign supreme. They save lives. They work quickly. They don’t need any follow-trough. And they’re so effective that other packaged interventions have vaccine envy. Of One Laptop Per Child, Negroponte has dubiously said, ”Think of it as inoculating children against ignorance. And think of the laptop as a vaccine.”"
Toyama, K. (2015). Geek heresy, p.64. "Leaders, implementers, and beneficiaries. This trinity determines packaged-intervention success, but their all-important traits can’t be packaged. No technology includes the empathy and discernment needed in leaders. No law bundles capable implementation. No system guarantees that beneficiaries will want what others believe is good for them. Exactly that which makes a packaged intervention work can’t be mass-produced. Technologists and technocrats might hear a challenge in that statement. They hate to admit the existence of systemic obstacles that can’t be overcome by sheer brilliance. … It’s the subpar schools we most want to fix with computers that lack teachers, principals, or IT staff who can make good use of technology. It’s the dysfunctional governments we most want to replace through elections that lack the institutions, civil society, and armed forces willing to hold up democracy. And it’s the jagged social fissures that we most want to stitch up with laws that lack the interpersonal trust and mutual respect needed for healing." Toyama, K. (2015). Geek heresy, p.68-69. "Of course, technologies *can* enrich lies; voting *can* empower citizens; and microcredit *can* lead to better livelihoods. But ”can” is not always ”will.” Modern society fetishizes technocratic devices, but it’s a human finger on the on-switch and a human hand at the controls. Why are we so enamored of shrink-wrapped quick fixes? Why do even those of us who know better tout them as real solutions?" Toyama, K. (2015). Geek heresy, p.73. "Toms shoes … is a for-profit company whose marketing strategy … is ”one for one”: For every pair of shoes sold, Toms donates a pair to a ”person in need.” The firm is wildly successful. Since its founding in 2006, it has handed out over 10 million shoes. … In the end Toms is a shoe company with a social responsibility arm. … Toms is not that different from Nike: They both sell overpriced shoes to brand-conscious customers, exploit cheap developing-world labor to pay their executives well, and spend a portion of their revenue on charitable causes (in Nike’s case, on the nonprofit Nike Foundations). But Toms does one more thing. By misleading presenting itself as primarily interested in charity, the company diverts the goodwill of people who might otherwise engage more deeply in a cause. In what psychologists call moral self-licensing, people use past good deeds – even minor ones – to excuse future apathy. So there’s a good chance that many Toms customers skimp on more worthwhile efforts, something they probably wouldn’t do if they bought their shoes from Nike, which runs its own social responsibility initiative but with less self-congratulatory fanfare. The greater jeopardy, though, is a broader *societal* self-licensing: By playing up effort like Toms, we as a society fool ourselves into believing that the world’s problems can be solved by enlightened consumerism." Toyama, K. (2015). Geek heresy, p.84-86. "I’ve participated in several social enterprise competitions as a coach, mentor, or judge. Talented twenty-somethings feverishly pitch projects, hoping … to ”do well by doing good.” The projects are tested mainly for their financial sustainability (read ”profitability”), their scalability (read ”market penetration”), and novelty and uniqueness (read ”potential monopoly power”). In the mad rush to conjure money out of hoi polloi, the ”social return on investment” often becomes an afterthought. It’s as if there’s no point to saving lives or teaching children if you have to keep paying to do so. Real social change is no easier to achieve with social enterprises than with not-for-profit models. They hype, though, allows business success to be confused with social impact." Toyama, K. (2015). Geek heresy, p.87. "Technocrats like to say that ”if it can’t be measured, it can’t be managed,” but this is simply not true. Most of us manage our relationships with friends and family without measurement. … Many countries have experienced dramatic economic growth well before they have had a system of national accounts. … The important thing is to establish meaningful goals first, whether or not they can be measured. Where direct metrics don’t exist, there might be indirect proxies." Toyama, K. (2015). Geek heresy, p.92. "[The inventors of vaccines had] heart, mind, and will. And so do the governments, large foundations, and multilateral like the World Health Organization that disseminate them. It may seem obvious that packaged interventions work best when leaders, implementers, and beneficiaries have great amounts of heart, mind, and will. But plenty of smart, influential people behave otherwise, as if spreading technologies and packaged interventions indiscriminately were the way to cause social progress. To do so, though, is to make an idol of the easy part and neglect the rest – the finding or nurturing of the right heart, mind, and will." Toyama, K. (2015). Geek heresy, p.112. "Technology amplifies preexisting differences in wealth and achievement. Children with greater vocabularies get more out of Wikipedia. Students with behavioral challenges are more distracted by video games. Rich parents will pay for tutors so that their children can learn to program the devices that others merely learn to use. Technology at school may level the playing field of access, but a level field does nothing to improve the skill of the players, which is the whole point of education. Technology by itself only increases the gap between the haves and have-nots." Toyama, K. (2015). Geek heresy, p.117. "It’s important … that in meeting one’s aspirations, some striving is involved. An aspiration achieved without effort doesn’t build wisdom. ”Undeserved” fame or fortune doesn’t necessarily cause growth, because they’re not accompanied by internal change. The spoiled children of inherited wealth are not particularly wise. The same problem occurs at a national scale when the resource curse of oil and minerals corrupts leaders and stunts other industries. Even more stable countries are prone to ”Dutch disease,” where the availability of an easy resource displaces other productive capacity, just as an overused crutch can lead to muscular atrophy." Toyama, K. (2015). Geek heresy, p.158. "Something happens as aspirations are achieved through valiant effort. When dreams come true, some people notice that they’ve outgrown them. Awuah says that in his last year at Microsoft [he] was no longer attracted to the extra 10 percent of income, recognition, or accomplishment that he had spent years pursuing. He wanted work with a broader purpose. These kinds of stories are common fodder for heartwarming news articles, but they are rarely discussed by policymakers. No one in the US government, the World Bank, or the Gates Foundation is asking, ”How do we encourage people through transformational internal epiphanies?”. Partly, the problem is that today’s metric-focused technocrats all but laugh at what seem like soft intangibles. … So much of behavioral science today overlooks long-term human change in favor of easily measured short-term phenomena." Toyama, K. (2015). Geek heresy, p.160-161. "tricks and nudges to incentivize ”behavior change” … casts individuals as adversaries to be manipulated, as if people just can’t be trusted to do the right thing on their own. The alternative is to ask, What makes a person intrinsically motivated for the larger social good? … Today’s number-crunching disciplines have no answer to such questions. But developmental psychology does. Psychologists going back to Sigmund Freud have sought to explain human maturation as a staged process of *personality*, *character*, or *life-cycle development*. … Some of [these] claims have been discredited by modern psychology, but in acknowledging the possibility of lifelong, intrinsically powered growth, they offer an alternative to today’s fast-twitch policymaking." Toyama, K. (2015). Geek heresy, p.161. "societies are infinitely complex, and social norms are notoriously difficult to alter. Large-scale social problems, though, are not intractable. Change may be slow, hard, and entangled in complex issues, but it happens. Most of us have witnessed it within our lifetimes, which should give us hope that mass social change is not a fluke. By considering cases of societal intrinsic development, we can see how they’re connected to individual intrinsic growth." Toyama, K. (2015). Geek heresy, p.174. "What was the secret to India’s IT sector? I was used to this question. In Brazil they wondered how India – historically much poorer than their country – was doing so well. In Kenya they asked what it would take to replicate India’s success. In Sri Lanka they talked about leapfrogging, like India, from an agricultural economy directly to a service economy, with no industrial phase in between. … The real secret … was India’s decades-long cultivation of its brightest engineers through institutions such as the IITs … the Indian Institute of Technology, a set of universities that graduate the country’s top technical talent. They were inaugurated in 1953 by Prime Minister Jawaharlal Nehru, and today the acceptance rate at these government-susidized schools is lower than that of Harvard’s or MIT’s. … Around the world, the lowering of investment barriers doesn’t automatically result in a thriving IT sector. … unlike the passing of investment policy or the importing of hardware and software, talent takes at least a generation to mature. India’s growth was predicated on decades spent building human capacity"
Toyama, K. (2015). Geek heresy, p.181-185. "There are no shortcuts to mastery. There is no technology, no institution, no policy, no method that can turn a novice into a concert pianist overnight. … True virtuosity requires years of motivated effort." Toyama, K. (2015). Geek heresy, p.193. "many qualitative researchers loathe the very idea of societal progress and the idea that one culture can be considered superior to another, especially in any moral sense. I sympathize with the aversion to ethnocentrism and cultural imperialism, but if progress is taboo, it’s impossible to debate the best routes to progress. It seems clear that a culture that engages in child trafficking, for example, is morally and culturally improved by ceasing it. The hard questions are not whether there can be progress or not, but what aspects of culture admit a notion of moral progress … and how cultures can engage with one another on moral progress without one culture imperially imposing its own ideas." Toyama, K. (2015). Geek heresy, p.263-264. "In the research world, it seems that those who are most concerned about the future of the biosphere (scientists) generally have the bluntest analytical tools to understand the causes of environmental degradation, whereas those who have such tools (social scientists, including anthropologists) tend to be less interested in the biosphere as an objective, biophysical reality." Hornborg, A. (2015). The zero sum game, p.10. "The view of international trade that still dominates the official perception and policies is entirely focused on creating profits ... at the same time it largely disregarding the unevenly distributed material impacts of trade on the biophysical environment, on human health and on access to technological infrastructure .... This is one reason why the term "unequal exchange" is generally perceived as irrelevant or incomprehensible to economists. Their basic assumption is that market prices themselves guarantee fair trade. Once a product or service has been paid for, according to market ideology, both sellers and buyers should be fully satisfied." Hornborg, A. (2015). The zero sum game, p.11. "In this book [I assert] that compensation in the form of money is only a surface phenomenon, an ideological idea of reciprocity, under which extremely asymmetric resource flows can be measured by entirely different dimensions, such as working hours, land areas, energy or volumes of materials. Although they are invisible to conventional economics, these net transfers of physical resources can explain the blatantly uneven global accumulation and distribution of technological infrastructure." Hornborg, A. (2015). The zero sum game, p.12. Hornborg, A. (2015). The zero sum game, p.13-14. "The invention of ”the economy" as a morally and politically neutral study object, and the focus on market prices, constituted (and still represents) an objectifying way of talking about the quotas according to which goods and services are exchanged between people, as if those quotas could be derived through logical necessity and objective circumstances. In fact, they are expressions of relative strengths, differences in purchasing power and dependencies, in short, inequality and power ... What would a conventional European economist answer a Tanzanian who wonders why his time (and hence his life) is only worth 0.3 percent of that of an American? Can economics offer a scientific answer as to whether this pricing is correct in the sense that it is comprehensible on an objective and morally neutral level?" Hornborg, A. (2015). The zero sum game, p.18. "Whether we discuss medieval theology or the world of neoclassical economics, we can say that once a number of irreversible axioms have been established, there is no limit for the complexity and inaccessibility of methodological constructs that can be built on the seemingly solid ground they offer. Whether it's medieval theologians or modern economists, the default response to opponents is that they lack the necessary education to understand the experts’ insights about the nature of the how the world works." Hornborg, A. (2015). The zero sum game, p.19. "Those ideologies that maintain privileges are ultimately propagated by the great need of individual persons to justify their lives. Warnings and requests for change are perceived as kill-joys. Well intended (but misguided) researchers choose to promulgate soothing messages based on trust and faith in ... conventional beliefs about growth, technology and development "
Hornborg, A. (2015). The zero sum game, p.21. "It has been established that the more unpleasant and harmful environmental consequences of modern society, such as garbage dumps, mining operations and nuclear waste facilities, tend to be located in areas inhabited by economically marginalised groups such as indigenous peoples and people with low incomes. An attempt to understand [these inequalities] from a structural point of view can first note that it is cheaper to contaminate or exploit land that which is adjoined to land that is utilised by groups with less purchasing power as such land usually has a relatively low price per square meter. From this perspective, injustices simply become a consequence of the logic of the market. As long as each individual economic actor wants to optimise business decisions, there will be a tendency for garbage dumps and low-income housing to be located in similar areas. To argue that this is contrary to fundamental principles of justice involves challenging the very core of the market economy." Hornborg, A. (2015). The zero sum game, p.23-24. "It is ... no coincidence that the modern discipline of economics was born at the same time as the industrial revolution in the one country that was at the center of the most powerful empire of history. The industrial revolution in 19th century England was based on a historically new strategy of accumulating wealth at the expense of others: instead of coercing peasants to pay tribute or making profits from trade by buying on the cheap and selling at a more expensive price, the industrial strategy was based on using mechanised production for exports and importing products that embodied increasingly large work efforts and land areas in countries with lower costs for labor and land than in the home country. ... Considered from a macro perspective, the Industrial Revolution was set to shift a country's claim on land and labor to other parts of the world system." Hornborg, A. (2015). The zero sum game, p.25-24. "The development of new technologies depends only partly on creativity, on drawings and on experiments. In order to be realised in the real social metabolism, a new technology must work in conjunction with the prices of energy, raw materials, spare parts, labor and finished products. It would be an illusion to imagine technical arts and engineering as independent from society's way of organising flows of energy and materials ... To say that [some technology] costs a certain amount of money is to say that it is only available to the person who can spare that sum. This is true not only for the richer countries' future visions of household robots, self-driving cars and space travel, but also the everyday technologies we currently take for granted in Europe. If a certain kind of category of people can afford to buy a certain technical product, for example if Europeans buy cars whose components are manufactured in China, that is largely due to the fact that Chinese workers earn much less money than the average European. That pay gap is inextricably linked to the emergence and distribution of technology in the world." Hornborg, A. (2015). The zero sum game, p.27-28. "In Sweden there are about fifty cars per hundred inhabitants while in China that number is 2. The lower wages in China are part of the explanation for both figures. Another part explaining why cars manufactured in China are in demand in Europe are the lower Chinese demands on the work environment and reduction of industrial emissions, which is also reflected in the price. That means that the majority of European consumption leads to a deterioration of the environment in other parts of the world system. This is the central and general problem in global environmental justice issues: to minimise costs, companies and capital seek out countries with cheaper labor costs and less rigorous environmental legislation, but to maximise revenue, products are sold in countries with higher purchasing power. Therefore, much of the consumption in high-income countries represent a shift of the environmental impact to inhabitants in low-income countries"
Hornborg, A. (2015). The zero sum game, p.28. "The fact remains that 86 percent of the global energy production is today (2011) based on fossil fuels, while only one per mille is based on solar power. Of this single per mille, 80 percent is produced in five of the world's richest countries (Germany, Italy, Japan, the United States and Spain), and solar power accounts for less than one percent of the total energy production in all of these countries. ... That solar power, despite high expectations, continues to be more expensive than the fossil energy that subsidises it tells us both that the possibilities of solar replacing oil, coal and gas is very doubtful and also that it continues to be available only in the most affluent sectors in the world system." Hornborg, A. (2015). The zero sum game, p.30. "Our collective dream of technical salvation beyond the oil peak rests on ... fragile grounds ... The solar energy produced by Sahara's solar panels will be reserved for those who can afford it - more likely German than Algerians. In other words the same global elite that today can afford to buy oil." Hornborg, A. (2015). The zero sum game, p.32-33. "Both scientists and the public tend to perceive technological innovations as improvements that contribute to a progressively higher efficiency of the economy. Contrary to this view is the *deterioration* of efficiency that paradoxically seems to increase over time such in the form of wasteful use of resources, environmental degradation and growing economic inequalities... the very prerequisite for profitability is often that the negative effects *remain* as externalities, so that companies' products can be sold at prices that consumers can pay." Hornborg, A. (2015). The zero sum game, p.33. "we must understand that what we usually call "cheap energy" reflects an experience not only from a certain historical period, but also from specific parts of the world system. Energy has been perceived as cheap only in the wealthy core countries of the world system, whose ideology of progress and development usually presents contemporary inequalities as manifestations of differences between historical stages. Draught animals and wood fuel are regarded as phenomena of the past, although they are still are a reality for significant parts of the world's population. Conversely, fossil fuel technology is perceived as a *now* rather than a *here*. But we should remember that too many Post-Soviet farmers, the machine age already belong to the past." Hornborg, A. (2015). The zero sum game, p.42. Is the annual solar budget large enough to maintain our current technological infrastructure? "For two and a half centuries, the rich part of the world's population has built up a technological system based on solar energy that was stored in the Earth's crust a long time ago. Each year, we have dispersed energy equivalent to *millions* of years of organic production of significant parts of the Earth's surface. We have, in other words, relied on land areas of *the past*. The current focus on so-called biofuels (e.g. ethanol) simply represents our intention to try to maintain the same technological system but using only the ability of the *currently* available ground surface to store solar energy. There seems to exist widespread confidence that this can be done. It's all just a question of finding the right technology. But what if it can’t be done?" Hornborg, A. (2015). The zero sum game, p.46. "Academics are generally expected to conduct their research in accordance to established ideals such as objectivity, integrity and intellectual honesty. Nevertheless, the social scientist’s lot is usually to work within the framework of research programs that have been formulated by the politicians who ultimately control their funding and that through subtle selection processes make sure that no key university positions are given to people who have something subversive to say about growth and development." Hornborg, A. (2015). The zero sum game, p.50. Hornborg, A. (2015). The zero sum game, p.57. Hornborg, A. (2015). The zero sum game, p.58. "The logic behind a fifth century AD Roman citizen's decision to build a water mill instead of buying slaves is basically the same as those decisions taken fifteen hundred years later by the affluent middle class deciding to buy vacuum cleaners or washing machines instead of hiring maids. In both cases, the owners of the machines could imagine that technical advances have abolished low-value work tasks. In both cases, however, a closer acquaintance with the socio-economic conditions under which the new technology is produced and maintained would probably have given them a completely different perspective. To take the most closely related example, it is today not self evident that workers who build vacuum cleaners in Chinese factories are better off than US maids." Hornborg, A. (2015). The zero sum game, p.78. "If the term "slavery" is not given a narrow definition that only means being a victim of direct violence but, more generally, being forced to perform alienating low status jobs for a privileged elite, then a very large proportion of the world's population could be considered slaves. Ostensibly neutral concepts like "technology" and "the world market" transfers their work and resources to an affluent minority with high purchasing power"
Hornborg, A. (2015). The zero sum game, p.79. "Up until the Industrial Revolution, the needs for energy and land were the same and they were linked by the production of food for human labor and feed for draught animals. However, during the last two centuries, during the fossil fuel epoch, the needs for land and the needs for energy have been separated from each other both in real and conceptual terms... When we now, in the modern industrial societies, begin to realise that peak oil and climate change may force us to become increasingly dependent on ”biofuels”, we actually imagine a future where the need for land and the need for energy will again coincide." Hornborg, A. (2015). The zero sum game, p.84-85. "It is often said that globalisation is not a new phenomenon. Processes that lead to increasingly widespread societal relations across vast distances can be traced centuries and even thousands of years back in time. A frequently overlooked aspect of these processes is that more highly "developed" regions - civilisation centres - tend to establish asymmetric relationships to their local or global peripheries which enables the accumulation of resources in the centre and often leads to environmental degradation in the peripheries." Hornborg, A. (2015). The zero sum game, p.112. "The intensification of agriculture is usually depicted as a process of technological improvements whose purpose it is to supply more and more people with food, but famine … isn’t usually as much about shortages of food in absolute terms as it’s about some groups of people not having access to food. This has, during the last centuries, mostly been an issue of who can afford to buy food. Intensive farming tends to focus on producing foodstuffs for export and food is often exported from areas that are suffering from famine." Hornborg, A. (2015). The zero sum game, p.119. "Although the appearance of a cleaner, seemingly dematerialised economy in more affluent countries might make it seem like economic growth is good for the environment, such a conclusion is an illusion. An alternative interpretation is that economic growth makes it possible to shift a country's environmental impacts onto other, poorer countries. In the era of globalisation, it should no longer be possible to imagine that one nation's geographical borders, its economic activities and its environmental impact coincide. To invoke a direct relationship between a nation’s GDP and its environmental quality in order to draw conclusions about the relationship between economic growth and environmental impact is based on exactly such unreasonable assumptions... one should, on the contrary, expect that one nation's environmental problems can represent the flip side of another nation's wealth." Hornborg, A. (2015). The zero sum game, p.126-127. Hornborg, A. (2015). The zero sum game, p.138. "While extraction zones tend to suffer from losses of biodiversity, soil, fish stocks and other vital resources, the economic centres of the world system have been affected by air pollution, acidification, eutrophication, accumulation of heavy metals and waste management issues. While the former problems are due to the deprivation of resources, the latter are associated with a concentration of material and energy consumption." Hornborg, A. (2015). The zero sum game, p.156. "During the 19th century, England's sugar imports grew by a factor of eleven, its carbon consumption by a factor of fourteen and its cotton imports by a factor of twenty. But the year 1900 these three products represented access to over 200 million hectares of productive land. ... It should be noted that Britain's total area is less than 24 million hectares. Import and extraction of these and other products was for the most part funded by the revenue from British textile exports. In other words, the whole point was that the intensive drive to develop mechanised mass production gave England access to an increasing number and amount of resources beyond the geographic area of the country itself." "The real problem is the enormous differences in purchasing power, and the fact that only half of the arable land is used for food production, and that one third of the harvested food is destroyed or thrown away. It is not newborn Indians or Africans who are the biggest threat to "global sustainable development", but newborn Swedes and Americans. [Thomas] Malthus realised that there are absolutely physical limits to growth and to withdrawing resources. The fact that most economists and advocates for economic growth can dismiss this obvious ecological truth is very strange. Although no one can predict exactly when or where in the world such boundaries are reached, their existence are a given. Those bigger crops that instil so much hope in growth optimists have primarily been based on imports of guano, phosphates, oil and other resources from the global periphery. Is it this kind of resource-intensive farming they want to globalize?" Hornborg, A. (2015). The zero sum game, p.177. "The confidence in technological salvation ... is cherished by all ideologies - red, green and blue. Beyond our oil dependence, we hope for renewable sources of energy such as solar, wind and biofuels, without realising that it was precisely these energy sources that our pre-industrial ancestors relied on and utilised as efficiently as possible. ... When our energy is no longer taken from the borehole in the ground, but from horizontal land areas, the competition for land between energy and food production, that the representatives of the industrial revolution thought we had overcome, will resurface"
Hornborg, A. (2015). The zero sum game, p.178. Hornborg, A. (2015). The zero sum game, p.189. "Various factors have been decisive bottlenecks at different times and places. Europe in the 19th century, for example, was in need of additional land, but was more than self-sufficient in fossil energy. The United States, on the other hand, is on the other hand in need of imported energy but has abundant access to agricultural land. Against this background, it is perfectly logical that Europe's colonial war was largely a struggle for land, while the United States’ modern wars in the Middle East is about oil." Hornborg, A. (2015). The zero sum game, p.199. "only about half of the world's 1.5 billion hectares of agricultural land is used for satisfying basic human needs of food - the rest is used for the production of fibres, lubricants, agrofuels, animal feed, tobacco, colonial drinks such as coffee and tea, exclusive fruits, etc. Of the food that is actually produced, a third is thrown away or discarded. A colleague of mine has estimated that if everyone was vegan, there would be room for thirty billion people on our planet without requiring further cultivation of lands." Hornborg, A. (2015). The zero sum game, p.202. "A general definition of power can be based on the observation that it is all about unequal access to material resources of various kinds, including energy. However, in order to be complete, a general definition of power must also explain how these inequalities are maintained socially. A reasonable suggestion is that most fundamental, but at least conspicuous, way of maintaining social inequalities is cultural mystification, i.e., making them either invisible or obvious and "natural." This is simultaneously a highly compressed definition of the term "ideology”." Hornborg, A. (2015). The zero sum game, p.237. "Modern technologies can not be made available to all people on earth, but instead represent strategies for redistributing time and space in a global society. In the longer term, fossil fuel-driven technologies furthermore mean that today's expansion of rich people's living space happens at the expense of future generations whose opportunities will be limited by exhausted oil wells and by climate change"
Hornborg, A. (2015). The zero sum game, p.246. "The visions of the political left a world of rich, equal high-tech states [is] no longer credible. Scandinavia of the 1960s, which for many has functioned as a development model to aim for, now appears to be a privileged corner of the world that was favoured by the successes of its export industries on a capitalist world market ... The levels of consumption - not least of fossil fuels - maintained by the average Scandinavian are neither physically possible for the seven million people of the Earth nor are they defensible from a global sustainability and climate perspective. Ambitious state-instituted welfare programs are possible only for as long as they domestic export industries are not relocated to countries with lower wages and taxes, or as long as welfare and consumption can be financed by credit." Hornborg, A. (2015). The zero sum game, p.247. "If economic science ... can be said to constitute an ideology ... it is even more interesting to examine just those aspects that economic analyses usually keep outside the field of view. ... How does the idea of morally neutral "world market prices" conceal asymmetric flows of work hours and land areas as if it was a matter of en equal exchange? Why do we represent the technological capacity of a particular population as independent of that population's position in a global system of uneven resource flows?" Hornborg, A. (2015). The zero sum game, p.255. "Early British economists like David Ricardo preferred not to explain their successes in the stock market by referring to the profitable slave trade or the predatory extraction of natural resources in the periphery of the colonial world. At that time in history and based on their social position, a British financier simply could not worry about unequal exchange. He must instead assume that monetary value is the only important benchmark and consider land, labor and capital as mutually interchangeable, and praise free trade as the very basis of economic growth. ... In order to prepare the way for industrial capitalism, it must obscure the uneven exchange of invested work and land areas used by observing only monetary prices." Hornborg, A. (2015). The zero sum game, p.267. "Harts book ... shows how powerful political entities like the United States and the EU beyond all rhetoric of free trade actually apply a very ”unfree” trade policy, especially in relation to agricultural products. The belief that all values are not freely substitutable is apparently as basic to nation states as it is to individual market actors. ... Agricultural land and its products are not like other commodities. It has not been difficult for the US and the EU to formulate good reasons for preserving, to a certain extent, their rural areas - socially as well as ecologically - rather than letting them becoming victims of competition from economically more efficient producers elsewhere in the world... It is without doubt remarkable that these powerful actors actually apply such protectionist policies at home since they have consistently denied ... their counterparts in the global South to apply the same measures." Hornborg, A. (2015). The zero sum game, p.272-273. Hornborg, A. (2015). The zero sum game, p.277-279.